but it was worth the four hour wait and the 4 mile walk home. Cherry Blossoms are from Wild Orchid Crafts. Quite clean and simple, I hope you like it. Great take on the sketch Anne and a lovely image, very pretty colours. Wasn't it good, wasn't it fine, isn't it madness.... sure that comes from a song!? lol Pity about the adverts. Gives a whole new meaning to the expression "on yer bike" The weather did us proud. Still haven't figured out where you were. Gorgeous card Anne, I like the adorable image and the colours. Oh I love those flowers - so soft and delicate!! Beautiful card Anne!! Oh Anne I love your card as much as you loved that Lycra. What a treat seeing Tour de France and 200 tight butts in Lycra it would have made my day. Joking aside I do love your card with the clean simple style and that lovely image. Your card is just so pretty. This is a great card and thanks so much for sharing it with us over at Sweet Sketch Wednesday 2 and good luck. Anne this is a lovely card. What a pretty image it is and your simple papers and flowers make it shine. 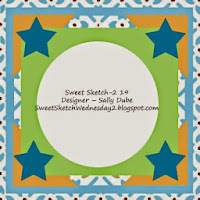 Thanks so much for playing along in the Sweet Sketch Wednesday challenge! Nicely done, Anne. Great colours.